Marshmallows make great math manipulatives! Preschool and Kindergarten age children will love practicing adding and counting with this super cute, hands on math activity. I love this super cute, hands on math activity for Preschool and Kindergarten age kids. It is fun, easy to set-up; plus it changes every time. I especially love the marshmallow manipulatives. 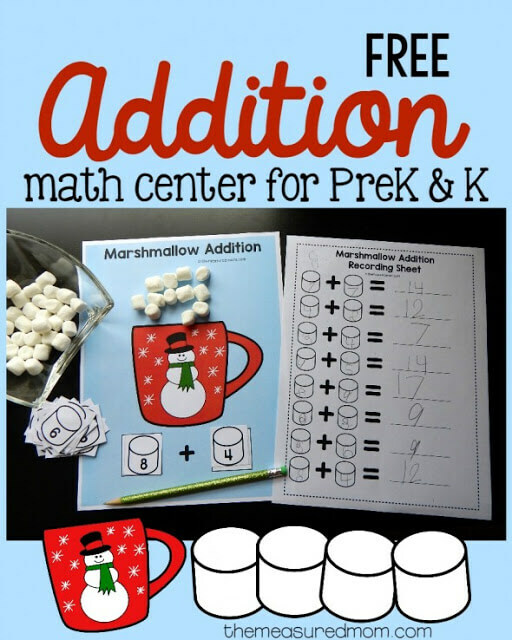 Kids will love practicing addition with this Marshmallow Addition Activity from The Measured Mom.